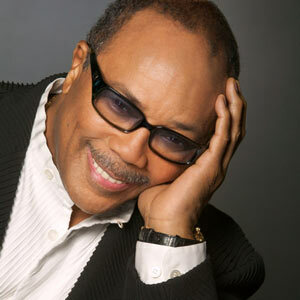 March 14, 1933 Quincy Delight Jones, Jr., trumpeter, music conductor and arranger, record producer, and film composer, was born in Chicago, Illinois. In 1951, Jones won a scholarship to the Berklee College of Music, but abandoned his studies when he received an offer to play in the band of Lionel Hampton. In 1956, he toured the Middle East and South America as musical director of the Dizzy Gillespie Band and upon his return to the United States began his recording career as the leader of his own band. In 1964, Jones composed the first of his 33 motion picture scores for the film “The Pawnbroker.” Other film compositions include “In Cold Blood” (1967), “In The Heat of the Night” (1967), “The Italian Job” (1969), and “The Color Purple” (1985). Jones’s recordings also garnered acclaim, including “Walking In Space” (1969), “Smackwater Jack” (1971), “The Dude” (1981), and “Q’s Jook Joint” (1995). In 1985, Jones produced and conducted “We Are the World” to raise money for the victims of Ethiopia’s famine. Jones also produced “Off The Wall” (1979), “Thriller” (1982), and “Bad” (1987) for Michael Jackson. In 1971, Jones became the first African American to be named musical director/conductor of the Academy Awards ceremony and in 1995 he was the first African American to win the Academy’s Jean Hersholt Humanitarian Award. Additionally, Jones has earned a record 79 Grammy Award nominations and 27 Grammy Awards, including the 1991 Grammy Legend Award. In 2008, Jones was designated a NEA Jazz Master, the highest honor bestowed by the United States on a Jazz musician, by the National Endowment of the Arts. Jones is one of the founders of the Institute for Black American Music which is raising funds for a national library of African American art and music and he is the founder of the Quincy Jones Listen Up Foundation which connects youth with technology, education, culture, and music. In 2000, Harvard University endowed the Quincy Jones Professorship of Afro-American Music, in 2007 Jones received the George and Ira Gershwin Award for Lifetime Musical Achievement, and in 2009 he received the Clinton Global Citizen Award for Leadership in Philanthropy. In 2010, Jones was presented with the National Medal of Arts, the highest honor bestowed on an individual artist by the United States, by President Barack Obama. “The Autobiography of Quincy Jones” was published in 2001.